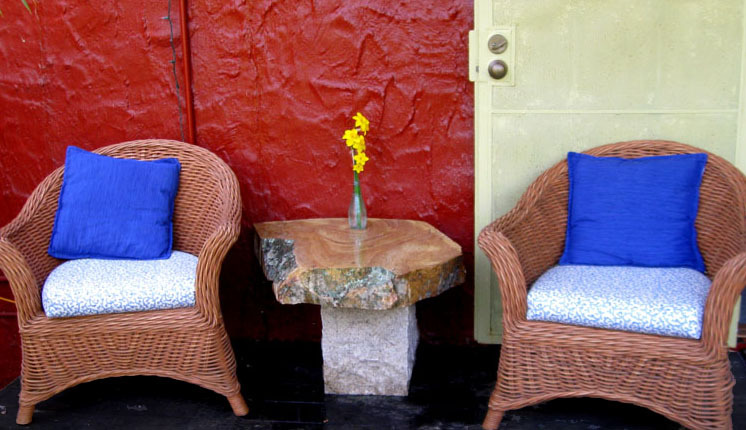 It’s not quite April, but we already feel safe to move our cushions outside and get our front porch ready for summer. The table on our porch is new for us this year, assembled from a slab and a block of granite. 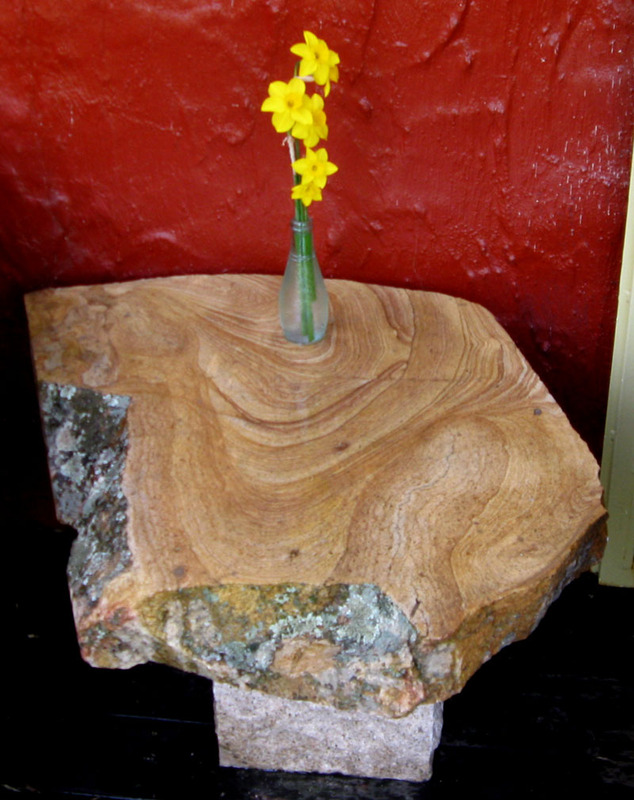 The stone’s called Big Springs, from somewhere in Utah, boulders cut into slices that are perfect for tables and benches. The stone has a beautiful grain, as if it were wood, and the sides have bluish and yellowish lichen. This table didn’t take any skill to assemble; I just put the flat stone on the flat-topped granite block. It didn’t need mortar or even a shim. The slabs aren’t particularly expensive, so I don’t understand why they aren’t more common. Doesn’t everyone want a three-hundred pound bistro table? There’s another photo showing the grain of the stone below. This entry was posted on Saturday, March 28th, 2009 at 11:16 pm and is filed under stone. You can follow any responses to this entry through the RSS 2.0 feed. You can leave a response, or trackback from your own site. Well Frances certainly speaks for me–I would love to have such a table. Any chance the slabs come in “thin slice”? Uh oh. Did I veer from garden blogging to garden gloating? It would take three men, but only one woman with a hand truck. It fortunately comes apart into two sections. I can’t lift the pedestal by myself, but the pedestal goes on the ground, so I’ve never had to.